Bashiok got in on a thread about the skill trees/tiers and provided a nice summation of how they work and why they’re set up as they are. So yeah, skills are tiered out for progression. Not only as a reward as you level up, but also to ensure we’re not dumping the entire game on a new player. Early tier skills tend to be cheap or free to cast, and have fairly straight forward mechanics and uses (do damage to enemies). As the tiers progress we introduce more complex systems, avoidance, mobility, maybe skills that cost a little more, or require a bit more finesse to pull off well. Then we get to the end of the tiers and these are usually the biggest, most expensive, and visually impressive. The tiers do start out simply and progress toward the bigger and ‘cooler’ spells. As they should. We can also design and tune the beginning of the game with the skills available in mind, which really helps to ensure those first few hours aren’t frustrating. Anyway, as I said, the end tier skills also tend to be the most expensive. While I’m sure there will be builds that take all the end tier skills, people will still need to pick skills throughout the tree to create a solid character, and we’re designing the skills to ensure they can continue to be as viable as possible regardless of character level. Some first and second tier skills will scale really well and I don’t doubt will be bread and butter for a number of builds. And just an FYI repeat of info – The leveling progression is designed that you’d have all your skill tiers unlocked before you finish Normal. The evolution of skill trees in Diablo III was quite tortuous, and if you didn’t follow it closely, you should check out the skill trees article in the wiki. It documents all the stages along the way, with screenshots, and it’s interesting to trace the trees, from their early D2-esque format to the current (finaly?) 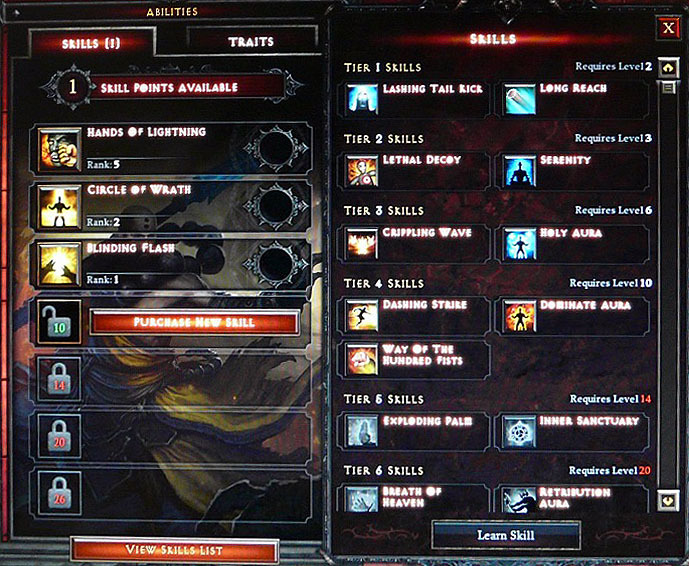 seven-tiered skill menu. The new system was unveiled at Blizzcon 2010, and after using it there and discussing it in many threads since, I like the design. (You see a screen of it below.) It has a nice progression, offers a lot of variety, and is fairly user-friendly. The biggest question still remaining is how the skills will scale up with more points, and how they are balanced for long term use. Is the goal to keep low tier skills viable for use late in the game? That gradual increase to the Slvl cap, plus the fact that skill damage is largely a product of your character’s attributes, equipment, and Clvl, means that the devs could balance low tier skills to make them viable even in the end game. A Tier 1 skill with 5 or 10 points should be a lot less powerful than a Tier 7 skill with 5 or 10 points, but why not balance them to be equivalent at Slvl 20, giving end game characters vastly more potential skill variety?